KAVA: “Shikaakwa” Haunting Rock Music That Is Simply Intoxicating! KAVA does what comes natural to three Chicago music veterans when writing, rehearsing and performing together. 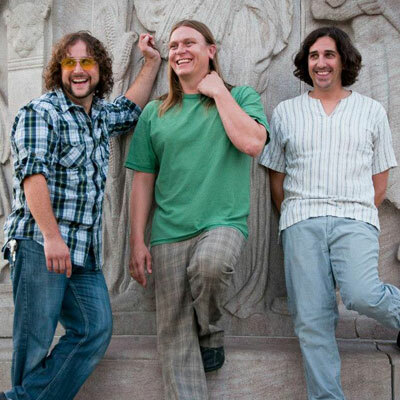 Ryan Behling (bass/vox), Wilson (guitar) and Marshall Greenhouse (percussion/electronics) first met while forming AfroZep, a national touring act that fuses African influences into Led Zeppelin covers. The trio clicked from the start. It quickly became obvious that it was time to move away from strictly arranging together and start writing original music. So they packed their cars with as many instruments as they could fit and headed far out of the city where they locked themselves up in a cabin for the weekend and experimented. The result was about 20 hours of recordings that included tightly composed odd time grooves in the vein of The Mars Volta, to 15+ minute minimalist jams which featured drones supplied by the Juno and Kaossilators. KAVA has since continued to hold retreats, toured the country, performed local shows (often fully improvised), recorded 2 studio EPs plus an experimental improvised EP and in the summer of 2013 released their first full length album entitled Shikaakwa. Every now and again a band capable of not just capturing the spirit of a bygone era but portraying it with uncanny authenticity and accuracy arrives, and in an era where music lovers seem increasingly ravenous for psychedelic-inflected, stoner rock, Chicago’s KAVA are precisely that act. Shikaakwa is just a phenomenal album. I have not heard any contemporary record that so strongly fits the 60′s psychedelic rock vibe, yet perfectly represents modern rock. That said, this recording sounds like it was transplanted from that era – in tone at least. Something sets it apart, however, because if it were straight up 60′s, it would sound dated and stale. The rhythms are hard, driving and pulsing without being fast. The sound is mesmerizing, hypnotic and there is an effective drone to the music. Ryan Behling, the lead vocalist, is a great compliment to the music, while the variety of guitar licks by Wilson, that supplementMarshall Greenhouse’s rhythms and drones, are sprinkled throughout. There is occasional dissonance and distortion which enhances the retro experience. The music is blues-infected; the lyrics are plaintive, informed, and emotionally conscious. There is a depth of symbolism in some songs and a more overt meaning in others. And despite the fact they can best be categorized as stoner-psychedelic, there is a lot more going on. This is a very talented group and Shikaakwa is such a very solid recording. Dim the lights, turn it up, and let the music wash over you. This group and particularly this recording are tremendous finds. If Jim Morrison had ever gotten depressed and joined Robert Plant in a psychedelic hard-rock/blues band, then the result might sound something like KAVA. Who in turn sound like a mix somewhere betweenLed Zeppelin and the Queens Of The Stone Age with a huskier Steve Perry on lead vocals. I told you they were a tremendous find! Of the seven tracks I was most blown away by “Keep It Alive”, “Tornado Eyes”, “Warroom” and “Staring Into Fire”. It takes a little while for the tracks to fully sink in, but like the effects of a good wine, when it does, this haunting rock music is simply intoxicating. All throughShikaakwa, KAVA plunge into taut blues-rock, ghostly hard-rock, fuzzy bass melodies, cycling electric guitars and other supernatural dirges. In a nutshell it’s dark psychedelic rock that’ll have you checking your calendar to see which year it is. I can’t wait to hear what they do next!